the reduction of a membrane's resting potential so that it becomes less negative. In cardiac physiology there are several forms: the normal slow diastolic depolarization of pacemaker cells; the slow but normal depolarization of cells of the atrioventricular and sinoatrial nodes; the rapid phase 0 depolarization of normal atrial, His-Purkinje, and ventricular cells; and abnormal depolarization resulting from disease. phase 4 depolarization the slow reduction of the membrane potential during phase 4 (electrical diastole); normal in pacemaker cells but sometimes abnormally accelerated. rapid depolarization the sudden reversal in electrical potential from negative to positive; it is represented by phase 0 of the action potential. 1. A relative reduction in magnitude of polarization; in nerve cells, depolarization may result from an increase in the permeability of the cell membrane to sodium ions. 2. The destruction, neutralization, or change in direction of polarity. 1. the process or act of neutralizing polarity. 2. in electrophysiology, reversal of the resting potential in excitable cell membranes when stimulated. atrial premature depolarization (APD) see under complex. ventricular premature depolarization (VPD) see under complex. the reduction of a membrane potential to a less negative value. It is caused by the influx of cations, such as sodium and calcium, through ion channels in the membrane. In many neurons and muscle cells, depolarization may lead to an electric impulse called an action potential. 1. The sudden change in electrical potential from negative to slightly positive which occurs during phase O of an action potential in an excitable cell membrane–in nerve and heart muscle. 2. A rapid alteration of the resting potential in a large mass of tissue–eg, heart ventricles, which usually results in a contraction. See Action potential, Latency period, Resting potential. The destruction, neutralization, or change in direction of polarity. The immediate cause of the formation of a nerve impulse. Nerve fibres normally carry a positive charge of some 70 millivolts on the outside of the fibre, which is balanced by an equal negative charge on the inside. When movement of potassium ions causes a local reversal of this polarization, the fibre is said to be depolarized. A zone of depolarization then passes along the fibre. This is the nerve impulse. Fig. 129 Depolarization . Depolarization of a nerve fibre. the process of reversing the charge across a cell membrane (usually a NEURON), so causing an ACTION POTENTIAL. In depolarization, the inside of the membrane, which is normally negatively charged, becomes positive and the outside negative. This is brought about by positive sodium ions rapidly passing into the axon. The RESTING POTENTIAL is restored by the SODIUM PUMP mechanism. reduction of the normal voltage difference between the inside and the outside of a cell. See also action potential, membrane potential. A change in the value of the resting membrane potential towards zero. The inside of the cell becomes less negative compared to the outside. This is due to a change in permeability and migration of sodium ions into the interior of the cell. 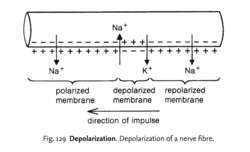 Depolarization is excitatory because the membrane potential shifts towards the neuron's threshold at which an action potential occurs. See hyperpolarization; synapse. Destruction, neutralization, or change in direction of polarity. n a neutralization of polarity; the breaking down of polarized semipermeable membranes, as in nerve or muscle cells in the induction of impulses. the process or act of neutralizing polarity as in the decrease of membrane potential. the conducted cardiac impulse transiently reverses membrane polarity. In this depolarized phase the myocardium is incapable of further contraction. As described in table 1, except BSO, all inhibitors provoked moderate increments in the percentage of apoptosis (25-30 %) and mitochondrial depolarization (20-35 %) in cells treated with ROT compared to cells exposed to the inhibitor alone or 55 G (control). It is known that mitochondrial membrane depolarization leads to mitochondrial calcium release  and also I[P.
The Maxwell-Garnet model and the depolarization factor [N.
The PP experiment allows probing more narrowly distributed relaxation modes and, in the conceptual limit of a very narrow polarization window, the experimental depolarization current peak is supposed to correspond to a single mode of relaxation , We used polarization windows two degrees wide, and we tacitly assumed that this window isolated single relaxation processes. At the same time of the discovery that endocannabinoids mediate DSI, Kreitzer and Regehr discovered that depolarization of cerebellar Purkinje cells induces transient suppression of excitatory transmission, (9)) which was termed DSE. The QT interval is equal to the depolarization plus repolarization periods of the heart. The atrial depolarization and atrioventricular conduction time did not exist in the PR interval and segment in the study of raptors. The pattern of the sequence of atrial depolarization and regularities of the reflection of excitation on BSPM in hypertensive rats is not described. For instance, a decayed off-potential or a rest potential with insufficient depolarization time may still be more negative than the native potential, or fall below the potential range shown in Figure 2 due to prior cathodic polarization. In fact, becatamide suppressed H202-induced mitochondrial membrane depolarization in a dose-dependent manner. Animals exposed to DE had increased sympathetic modulation, prolonged ventricular depolarization, and shortened repolarization periods, and they developed arrhythmia at lower doses of aconitine than controls.